In addition to rafting, we also offer accommodations. You can camp with us for free with the purchase of any rafting trip at Robson Shadows Campground. You can also stay with us at Mount Robson Lodge. Mount Robson Lodge provides comfortable, affordable cabin accommodations close to the Park and overlooking the Fraser River. The lodge is ideally located for exploring Mount Robson Provincial Park. Situated on Yellowhead Highway 16. 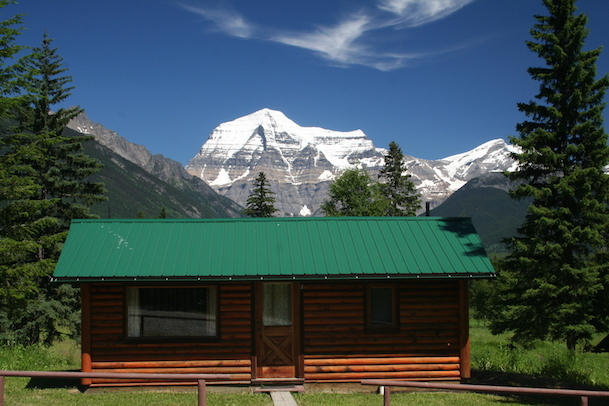 5 km/3 mi west of Mount Robson Provincial Park, the lodge has log cabins in full view of Mt. Robson, the highest peak in the Canadian Rockies. Robson Shadows Campground is located 5 km (3 mi) west of Mount Robson Provincial Park and is open May 15 until the end of September. The campground area has a panoramic view of Mount Robson. Natural campsites on the Fraser River, group site, washrooms, showers, fire pits. Recreation around Mount Robson Provincial Park includes hiking, sightseeing, white water rafting, helicopter tours, horseback riding and mountain climbing. We are located a short drive from Jasper, Alberta.